Home Costs > How Much Does a Metal Roof Cost? A metal roof is a type of a roofing system made of metal pieces or tiles. It can often be a broad term since it can refer to so many different materials and systems. A metal roof has many advantages such as being durable, portable, resistant to hail and the wind, and is environmentally friendly since metal is easily recyclable. The cost of a metal roof will depend on the brand, the size of the roof, if a contractor is involved and manufacturer of the roofing material. On average, the cost to have a metal roof professionally installed can range anywhere from $400 to $1,200 per roof square, which is equal to 100 square feet. This is how most contractors will price your job when they give you a quote. Compared to a traditional shingle roof, a metal roof can cost two to three times more. The main reason this type of roof can be more expensive than other type is due to the labor required. According to roofingcalc.com, only professionals with the right experience, skills, equipment and training will be able to install accurately. Since this type of roof isn’t simply “nailed” to the roof deck, it can take up to three times longer. Metal Roofing systems claim it can cost anywhere from $3.50 to $12.50 per square foot to have a metal roof installed. Your lower bid will often be a low-end corrugated and ribbed metal material with exposed fasteners, while your higher end quotes will be often made from a stone-coated steel tile or metal shingles. The factors, according to the website, will be based on the roof steepness, the height, complexity, dormers, chimneys, skylights, the number of layers, if an older roof has the be removed and the contractor. As for material, the website says it can be anywhere between $1.50 to $5 per square foot, depending on material. Considered one of the most pliable metals, it can easily be shaped, accommodating virtually any design. Out of all metal roofing material, this is considered to be one of the most energy efficient. Copper is known to almost last forever. Look at the Statue of Liberty, for instance. This corrosion and rust resistant metal is known to have a wonderful track record. Tin is known to be extremely affordable, and like aluminum, it can be shaped into various designs. Its naturally corrosion resistant properties make it a good choice. This marvelous metal will actually heal itself as it weathers dings and dents over the years by forming a special coating. When you get a quote from a contractor, they are going to factor in the following: the metal price on the market at the time, the waste, shipping and local labor rates. Depending on the job’s complexity, the waste percentage can be about 15 percent of the quote, while shipping can add another hundred dollars or so to the cost. Labor, depending on the details, can be the most, usually about 70 percent of the quote. Most metal roofing material will be made of either a G-90 galvanized steel or aluminum, while a standing seam panel can be formed from galvalume steel or aluminum. Most systems will be finished with a higher-end paint. 29, 26 and 24 gauge — terms you will often see — will refer to the thickness of the roofing material. 29 will be the thinnest material, often recommended for residential applications, and the lower the number, the thicker it will be. Thicker metal roofs will be recommended for commercial applications. Steeper slopes or adding details, such as gable edges, ridge caps, special coatings or pipe flashings, can increase the costs by twice, if not three times the amount. A coating is highly recommended, and this will protect the metal roof from the elements. It can cost about $150 to $225 per 100 square feet if you choose to have your contractor apply it. Most contractors should include underlayment with their quotes; however, if they don’t, the average price of an underlayment roll can be about $40 to $60 per roll. People often think that metal roofs are quite noisy when it rains, but this isn’t the case, though. While the roof is made of metal, it won’t be any noisier than other roofing materials. As long as the underlayment is installed correctly, you won’t notice a difference in terms of noise. 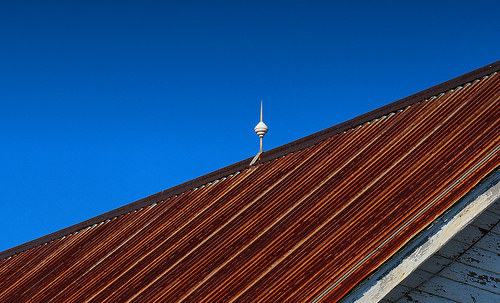 Another common misconception is that a metal roof can rust over time. While some cheaply made roofs can rust, it’s best to look for those that have a limited warranty for a long period of time. It’s best to stand by a product that carries a warranty of at least 25 years. Metal roofs won’t attract lightning. Lightning only strikes the highest point, regardless of the material. Studies have shown that a metal roof can prevent damage by dissipating electrical charges. Installing a metal roof can bring down your homeowner’s insurance policy by more than 30 percent, and there are also tax credits available for those who install them as well. Each state will vary with their own policies. According to Home Advisor, if you were to sell your home, they say you can recoup close to 95 percent of your investment. It offers great protection from the elements and won’t peel or crack like asphalt. It’s also extremely durable, being able to withstand winds up to 130 miles per hour. Since it helps the environment, you should be able to take advantage of tax credits. Metal roofs are great for your energy bill, saving you close to 40 percent or more. In some cases, you don’t even need to remove your existing roofing material as it can simply be installed on top of it. Metal tends to be the most expensive type of roof you can purchase, up to four times more than traditional asphalt. The roof will require extra insulation before installing to reduce the noise. If a problem were to arise in the future and a portion of the roof has to be replaced, the colors may not match up if you’re not able to find your original roofing material. Having a metal roof installed on your house can be pricey, but this can also allow you to save money in the future. Since a metal roof usually lasts from 30 to 50 years, it is considered a good investment since there’s a good chance you won’t have to replace it again. Also, according to some research, this roof can save your energy costs by close to 40 percent.